Summer is upon us and the weather is heating up. On Saturday it started getting warm early and gave us a good excuse to head to the coast for some breakfast. I love that we have such easy access to the coast from Petaluma. It makes it possible to take a trip west on a whim. 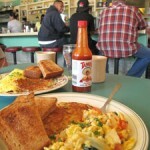 Our impromptu plans for breakfast took us to the Pine Cone Diner at Point Reyes Station. We occasionally pass through Point Reyes Station, stopping for coffee or to pick up some cheese at Cowgirl Creamery, but somehow we never linger very long. Point Reyes Station is a destination for many day-trippers and cyclists and is often buzzing by midday. Visiting in the morning gave us a chance to see the calmer quieter side of this little town of just 350 people. The Pine Cone Diner is tucked away on the north end of town, its humble sign peeking up from the end of a small shopping center. It is one of those places that caught my attention because it wasn’t trying so hard. I am a diner fan. 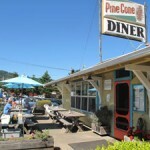 They are usually friendly, unpretentious, and offer up hearty home-style food; the Pine Cone is no exception. The décor is authentically diner-style, stools lined up along a long counter, bouncy vinyl booths lined up under the windows. One wall is covered in a colorfully mismatched assortment of old plates. It is cozy and bright inside with extra seating on the sunny front patio. The diner has a history as a truck stop but has been the Pine Cone for over a decade; it is comfortably worn and has plenty of character. And, in the corner there is a stack of booster seats and buckets of toys. In typical Sonoma-Marin fashion the Pine Cone features locally produced sustainable food with a breakfast menu to make everyone happy. We ordered a tofu scramble and a cheddar and bacon omelet. We were very satisfied on both counts but eyed the blueberry pancakes with envy. The portions were hearty but not so big that I felt guilty. The coffee was good and frequently topped off. 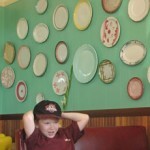 The buckets of toys kept our son occupied almost the entire meal – a rare treat! Walking off our full stomachs we strolled down the center of town, stopping in at a couple of markets, trying out some Adirondack chairs at the hardware store, then cutting through Toby’s Feed Barn (more on that place later) to a small park. The weather was breezy, balmy, and in the high 70’s. The park was elevated just enough to provide a view over the top of the town. We enjoyed the weather while our son busily climbed and ran away the extra energy he’d built up during our drive and breakfast. Heading back, we window shopped the western side of the street, hitting Cowgirl Creamery to watch some cheese making before jumping back in the car to head home. It was a really good start to the weekend.